Hank Mallone knows he’s in trouble when Maggie Toone agrees to pretend to be his wife in order to improve his rogue’s reputation. Will his harebrained scheme to get a bank loan for his business backfire once Maggie arrives in his small Vermont town and lets the gossips take a look? Maggie never expected her employer to be drop-dead handsome, but she’s too intrigued by his offer to say no . . . and too eager to escape a life that made her feel trapped. The deal is strictly business, both agree, until Hank turns out to be every fantasy she ever had. 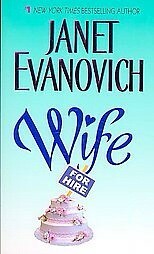 Janet Evanovich is one of my favorite chick lit authors and even after reading a book of hers I can go ahead and read it again and it’s still as entertaining as the first time. This book was a fast read. It’s one of those cozy books that I like to read while laying in bed on a rainy day.